On December 3, 2018, Rt. Wor. Chris St. Cyr, District Deputy Grand Master for the 24th District visited Quinebaug Lodge for the last time as District Deputy. Wor. George Makara, Master of Rt. Wor. Bro. St. Cyr’s home lodge, praised his rise as “worthy of a man” to the assembled 100 plus Master Masons. 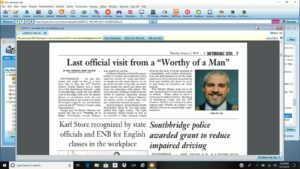 His visit, a joy for the Lodge and the District he’d served for the past two years, was also written up in the Southbridge News.